Up to date, accurate, unbiased, information concerning issues that affect the climate of homeschooling in North Carolina. I was recently asked about organizing homeschool stuff. I don’t have pictures right now, but I can tell you a bit about how I organize our homeschool supplies. I have a bookshelf in my living room that holds our Five in a Row books, KONOS manuals, dictionaries, and other reference books. It’s handy to have the unit study books in the living room. I have a separate bookshelf with the encyclopedias and Bible dictionaries and commentaries. Upstairs, I have three bookshelves in the hallway. I keep one bookshelf full of classic fiction books, such as the Boxcar children and Little House books. The other two bookshelves hold books I have collected for various unit studies that we have completed and completed curriculum books that I am not ready to get rid of. In my bedroom, I have a craft closet that I keep all of our messy craft items put far, far away from the little ones. I also keep some science supplies in there that are hazardous to the little ones. That pretty much covers how I organize. Please ask and questions or post comments. We are in the midst of redoing flooring in two rooms this week, and I can’t take good pictures right now. Biltmore House and Gardens presents….. Celebrate harvest, Autumn and all the traditions of the season. between the farmer and the kitchen. self-guided visit in Biltmore House, Gardens, Conservatory and Winery. What are you doing to cut grocery costs? Unless you live with a 6 month supply of food on hand, I am sure you have noticed that food and staple items have been increasing in price on an almost weekly basis. What are you doing to cope with it? I have implemented several strategies. I use The Grocery Game to help me track sales and coupons for my favorite grocery store, Walgreens, and CVS. My husband and I decided to split a cow with a friend. So we have about 6 months’ worth of grain-fed, hormone-free beef in our deep freezer. My husband and children planted a garden this year. I have stopped buying certain items that we really did not need. We have a flock of chickens who are just starting to lay about 4 egss per day. That should increase as the younger chickens mature. We have 13 chickens right now, but my husband wants a few more. I can easily use half a dozen eggs at breakfast time. I also try to make a monthly trip to Sam’s Club and Aldi’s. Both of these stores are close in proximity to one another, but they are about 30 mins away from my house. I try to plan several errands in that area. And I take a cooler and ice. Our Aldi’s has been the best place for eggs, milk, and baking ingredients. At Sam’s, I buy large bags of rice and flour and a few other items. Most of my Sam’s purchases are office supplies for my business. I also read Money Saving Mom’s blog daily. She has the best resources listed, and I always find links to other bloggers who are saving money on various items. How are you keeping your grocery costs down? In March, I had the opportunity to meet Louise Barrett Derr. She wrote an activity book for children called, Experiencing Bible Science. Since I have 5 active boys who love science, I was excited to see how her book incorporated simple science experiments with the Bible. Each experiment uses items you would commonly find around the home, and each one is made for the student to do on his or her own, except for the last experiment. Of course, you would make the decision yourself whether to let your student complete the experiments autonomously or not. I sell her book on my website and in my store for $13.99. The regular retail price is $16.95. This book would be a great addition to your science program for elementary-aged children or as a summer resource. Great contest over at Rocks in my Dryer! This is a super-easy contest to enter. You just need to link to http://www.wowonline.com/ on your blog and then put your info in Mr. Linky on Shannon’s blog at Rocks in my Dryer! YEAH!!! Here are some links for you, since I have spent too much time in front of the computer in the last 2 days. First off, I am hosting the Carnival of Homeschooling on my OTHER Blog today. Secondly, my friend, JenIg, has a new blog home. You can find her at www.jeneralities.com. And you can find her sister, Jess, at http://we2r1preston.blogspot.com/. Sterling Point Books has repreinted many favorite, classic books. I wanted to read The Stout-Hearted Seven Orphaned on the Oregon Trail, because I remembered an old movie from my childhood called Seven Alone. This book beats what I remembered about the movie. It is also based on the actual writings of primary sources. The facts are presented from writings by two of the Sager children, as well as from letters from Marcus and Narcissa Whitman. This story captured me so quickly that I ended up reading the entire book in one evening. I enjoyed it so much. I have not read it aloud to my children as yet, because I am not sure if I can read it without crying during some parts of the book. I also want to point out what a fine job the publisher has done with this book. The paper that it is printed on is of the best quality. It is not newsprint paper. The font the publisher chose is also easy to read for size and clarity. I could have not been more pleased with the quality of this book, especially for the price. Currently, there are 25 titles available from this pubsliher. Expect more! They are doing a wonderful job bring back some classic books and classic Landmark books. You can purchase this book from my website or from many online retailers. As a mother of five sons, I am always looking for good fiction books for my boys to read. 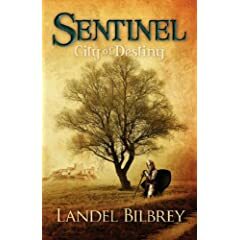 When I was offered the opportunity to read Sentinel: City of Discovery, I was excited to read it myself. This book is an allegory, and it shows what happens to two young men who are twins. One twin makes good decisions in his an dinto adulthood, and one twin does not make good decisions in his youth and into his adulthood. And the book ends with an epilogue that tells where each man ends up as an adult. There are few books that are good, quality literature for young men, and this is one that I would highly recommend. It has plenty of action to capture their attention, and it causes the reader to use his or her imagination in seeing this story untold in his or her mind. I hope Mr. Bilbrey has some more stories to tell. I am sure that my boys would enjoy them as much as this one. You can purchase this book through Amazon.com or BarnesandNoble.com. I have had the privilege of reading Dr. Ruth Beechick’s newest book, A Biblical Home Education, and as a seasoned homeschool mom, I learned so much from her years of wisdom. She does not recommend a big, fancy curriculum to teach your children. She starts out by recommending that you use the Bible as your main curriculum. And later in the book she gives a few specific book suggestions. But her first goal is to let you know that it is okay to not depend on a curriculum to prepare your children for his or her future. She suggests that you allow your child to grow in the Lord, and your first responsibility is to train your child in the ways of the Lord. I wish I would have had this book several years ago. It is so easy to hear what great things your friends are doing with their children, and then beat yourself up for not doing “the perfect” curriculum like your friend. All familes are different, and all children within a family are different. I have six children, and I see this in action every single day. This book has practical ideas and suggestions for you to utilize as they suit your family. One of my favorite resources is found at the back of the book. She has included an Appendix with information on Cross-Dominance. If you have a child that easily confuses “b’s” and “d’s”, you know that I am talking about. She has included some exercises to help your child with cross-dominance issues. I also enjoyed her chapter on nutrition for children with behavioral issues. If you are looking for a good book to rechagre your homeschool this summer, I highly recommend A Biblical Home Education. You can purchase it from my website for only $12.99 or from other sources of homeschool materials. If you like my blog and reviews, I would appreciate your support of my business, too. God has enabled me to minister to many homeschool families through my business, and I would like to continue blessing others as God has blessed me.